How do you talk about your business’s strategy so that your employees get it? Any strategic planning session eventually needs to deliver a robust strategy, one that anyone can understand and execute. The truth is this rarely happens, as most strategic plans end up in a binder somewhere, and confuse more than enlighten people. Tagged Communication, Decision making, Strategic planning, Strategy. Is consensus and a democratic process always to best way toward innovation? Not really. The topic of deciding what ideas to pursue comes often in discussion, it’s a very interesting topic because it directly influences the how of innovation. And the way innovative companies approach decisions that lead to innovation are varied, but one thing holds true in all of them: it fits with their point of view. Innovative companies that have their own criteria of what ideas to pursue are clear about their decisions, therefore decision making is much more open; it’s a result of having a clear strategy. In traditional businesses, on the other hand, when deciding on what ideas to pursue the default answer is to pursue the ones that might yield the highest profit at the lowest risk; MBA 101. Decisions based on that criteria are not conducive to innovation. Innovative companies don’t worry about consensus because they understand that true game-changing ideas rarely are born out of consensus. It’s really that simple. In these organizations innovative leaders understand that the most creative people frequently swim against the current, they don’t vote them out of contribution; rather they unleash them. As an entrepreneur / intrapreneur inside large organizations, you have a great opportunity in front of you but you must understand that not everyone should like your idea, nor should you want them to; you have to push with full conviction. As the renown venture capitalist Andy Rachleff likes to say, the sweet spot for an innovator is to be right about a new opportunity before the rest of the world has reached a consensus. That means making a decision without over analyzing and figuring things out as you go along. For me, decision making is very easy because I just focus on what I’d like to see in the world. With that said, ask yourself: what do I want to see out in the world? Do the decision-making processes at your company facilitate or debilitate innovation? 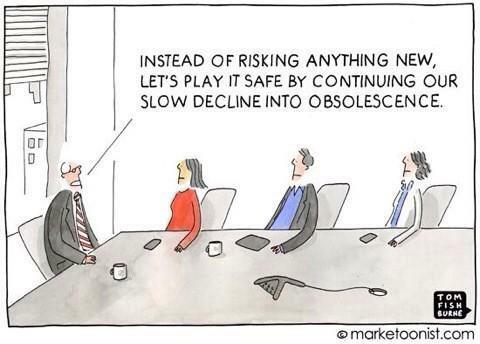 Bottom line: Disruption is not born out of consensus. If you’re making a big decision, you can’t wait for everyone to agree. To move projects forward, redefine consensus. The most innovative companies aim to develop the best possible idea. What that looks like is unique to their point of view and criteria; not what everyone else is doing. Throughout this past year, I’ve been having conversations with innovation leaders from a couple of BIG companies about re-inventing their innovation capability. The pattern of conversation: we’ve had a good run, but feel that our process for making innovation happen is delivering incremental results. Bureaucracy has developed, and so we aren’t taking a lot of risks anymore. How do we shake ourselves out of it? This is a classic situation of the initial innovation enthusiasm becoming stagnant because innovation’s main killers are not kept at bay: GroupThink and ExpertThink. Tagged Decision making, disruptive innovation, ExpertThink, google, GroupThink, Innovation, Leadership, management.